You Can Be a Hot Redhead if~~Your skin is on the pink side, There is a “right” red out there for most women, says Jennifer J, a Matrix celebrity hair colorist and owner of Juan Juan Salons in Southern California (she colors Julia Roberts’s auburn red hair), but women with cool or pinkish skin pull it off best. 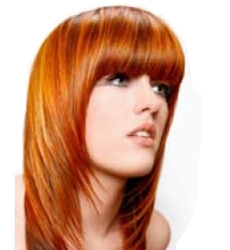 Conversely, women with golden or olive skin have a tougher time finding a red hair tone that’s flattering. You Can Be a Hot Redhead if~~Your hair is in fairly good condition. If your hair is very dry or damaged, the strands will have a hard time holding on to small, red hair color molecules (which seep out of even the healthiest hair fairly quickly). Your mane has a better chance of becoming radiant redhead if it is well cared-for (read: you deep-condition weekly, get regular trims and don’t heat-style every day). Hot Redhead Tip~~Wash your hair as infrequently as possible, Ideally this would mean twice a week, says Parvine Klein, a red hair colorist at the John Barrett Salon in New York City, but every other day will suffice if your hair is oily or very fine, says Jennifer J. On alternate days, you can rinse your hair with tepid (never hot) water if necessary or dust your roots with a dry shampoo. Hot Redhead Tip~~Avoid harsh shampoos. Most dandruff treatments are tough on colored red hair says Jennifer J. But they are death to hot redhead, accelerating the fading process by weeks. Hot Redhead Tip~~Cover up. Red hair color oxidizes faster than any other says Forgash. So, if you’re going to spend a lot of time outdoors, use a styling product that contains UV filters, or throw a hat or scarf over your red hair. Hot Redhead Tip~~Don’t be tempted by eggplant tones. Purplish-reds don’t look natural and are rarely flattering, says Jennifer J. Choose a red hair color that can be described as “coppery,” “auburn” or “strawberry” instead. February 26, 2012 By: Barb Quinn Hairstyle Blog Leave your comments (0), Your input matters.